Here at Sumibi Steak Sakai, you can enjoy exceptional, high-quality wagyu beef. The restaurant is a 5-minute walk from subway Karasuma Oike Station. They care a lot about the beef they use at this restaurant, so they offer not-oft-seen beef from Hokkaido, from around Lake Mashu, and world-famous Kobe beef. This high-grade beef is prepared by the chef, Mr. Kamata. Mr. Kamata is a “meat professional” who knows everything there is to know about choosing, cutting, and grilling beef. This is why you can always enjoy quality steaks at Sumibi Steak Sakai. The food here is, of course, great, but what really separates this restaurant from the others is the great service that puts the customer first. To make sure that your clothes don’t get a smoky smell, the restaurant is, of course, nonsmoking, but they also have set up their facilities in such a way that you won’t have to worry about the smell of grilling beef sticking to your clothes either. The steaks are served to you rare here, and then you get to grill them yourself, so you can cook them to your liking. Because of their dedication to your satisfaction, you get to enjoy your dinner and talking with your friends to your heart’s content. The interior of the restaurant uses wood in many places making the atmosphere feel modern, but they also have a Japanese garden in the back, so there is a Japanese feeling to the atmosphere too. You can enjoy talking with the chef and watch him cook the dishes if you sit on the counter seats, but they also have tables in the back of the restaurant. The lunch prices here are rather reasonable, so you could visit this restaurant more than once too. This course, Sakai, contains seven dishes, from appetizers to dessert. 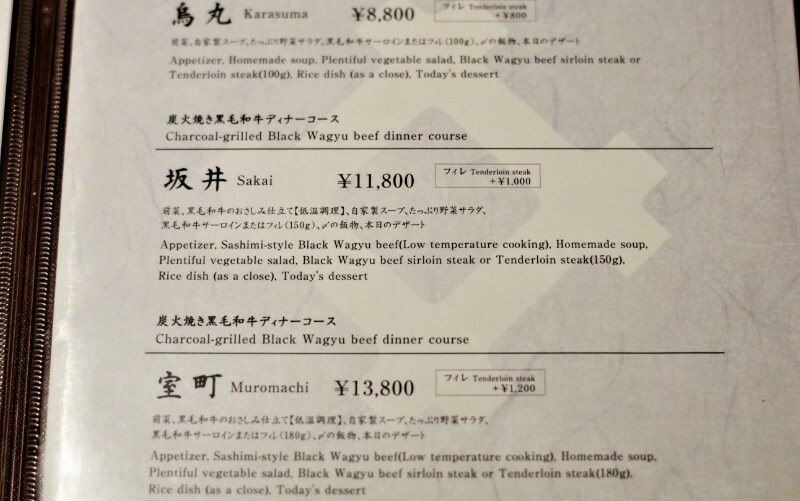 The seasonal appetizers and soup are delicious and you get to taste seasonal produce, but I would like you to note the black wagyu beef which is cooked in many ways. First, the black wagyu sashimi, which is slow-cooked at only 56 degrees Celcius, was a first for me: the softness of the meat was exceptional. You dip the wagyu sashimi in soy sauce, just like you would real sashimi, and it melts in your mouth. Next, you get the main, the steak, which is cooked rare, and then you get to cook it however you wish on the small charcoal grill. You can eat the steak with salt, mustard, soy sauce, wasabi, or lemon. It’s nice you get to enjoy different tastes. Lastly, you get a nigari-beef-sushi. It’s a luxurious treat with uni (sea urchin) and truffle on the top. When eating it, I felt that the saltiness of the uni and the fragrance of the truffle made the taste of the beef stand out, making this a nice ending to the meal. This course is truly a treasure trove of beef, but the salad dressing made using bitter orange and the salad are also great and make this a balanced meal. Lastly, you get dessert, which contains a lot of fruits, and a cup of tea by Kyoto’s famous Ippodo. The tea is Kyo-bancha, which has a nice smoky flavor. They offer premium beef sirloin steak gozen for lunch. Right from the moment the meal is brought to you, you smell the appetizing smell of beef. The beef sirloin steak is cut into thick pieces, so there is a punch to the way it looks. The steak is served on a hot stone plate, so you can continue cooking the beef on it, and it also keeps the steak warm. If you eat a piece, you’ll notice the umami of the beef and the sweetness of the fat right away. Besides the main beef sirloin steak, you get a kobachi (small bowl), salad, rice, tsukemono pickles, and a suimono (clear soup). The rice is “Kankyo Kodawari Mai” from Shiga Prefecture’s Takashima City, and the rice is nature-friendly, as it uses almost no pesticides and artificial fertilizers. The soft and fluffy rice goes well with the steak. This is the official wine of the cruise ship Asuka, and also chosen as a wine served in the first class in ANA’s international flights. So as you can see, Kenzo Estate’s Yui has been gathering good press since it hit the market in 2008. This Kenzo Estate rose wine is only produced in limited quantities, so it’s not often you get to see it at a restaurant. The refined rose pink of the wine is beautiful, and it has cherry and strawberry in its fragrance, and the taste is refreshing, dry, and fascinating. The name Yui means a connection between people, their hearts, and this kind of spirit of living peacefully together. This wine is the connection between the people and Kenzo Estate. It also goes very well with the steaks of Sumibi Steak Sakai. This is the main brand of Kenzo Estate, who also make Yui, their Rindo red wine. From the moment the wine is poured to your glass, you’re enamored by the rich beauty of the Bordeaux varietals. This wine is a blend of Bordeaux style wines, and it has a comforting easy-to-approach taste to it, but at the same time, the taste is powerful and has a fruity depth to it. It also goes very well with the meat and lets the best parts of both the meat and the wine stand out more, doubling the umami. Their menu is in English, both the food and the drinks part of it. Their lunch menu has pictures on it so ordering is easy. At Sumibi Steak Sakai, they also have a takeaway bento box called “Premium wagyu steak bento box (￥3,500+tax). This beef in this bento box is grilled on charcoal, and then steeped in the special house sauce, and then it’s all stuffed in a box with rice, making the bento box look extravagant. This way you can easily enjoy the most popular lunch menu item of Sumibi Steak Sakai. You can eat it while on the move, or at your hotel or ryokan after sightseeing. The meat used at Sumibi Steak Sakai is carefully chosen; they only use the highest grade meat, so you get to enjoy the strong taste of beef and the umami in it. It was delicious! The meat was soft and easy to eat; that’s what I remember the best from my meal. The chef Mr. Kamata was talkative and told me a lot about all the different dishes. I was pleased to see the staff work hard. Not only the great food but also the great service here made an impression on me! This restaurant is my recommendation for families and groups of friends that want to have a good time, as, besides their counter seats, they also have tables in the back with a view to the Japanese garden. I was looking forward to my visit to this restaurant, as I had heard that they offer a rare type of wagyu from the area around Hokkaido’s Lake Mashu. This time I tried the lunch sirloin steak and dinner tenderloin, which were served rare, and then you got to grill them yourselves. You also got many condiments and could enjoy a different taste every bite. As I was stuffing the meat into my mouth, I was surprised by the lightness of the taste, and how the fat in the meat melted in my mouth. It’s easy to get to this restaurant, as it’s in the center of the city, so I’m thinking of going for lunch or after work for a bit of wagyu! A 5-minute walk from subway Karasuma Oike Station’s exits 5 and 6. The menu is in English. The staff can understand some simple English.